Stuart Isett/Corbis Sygma for TIME. REST FOR THE WEARY: A pair of elders take a break from a traditional Ainu ceremony honoring the dead. The ainu of japan have long been almost invisible in a society that likes to consider itself racially homogenous. Often they hide themselves. Yuki Hasegawa, for instance, grew up thinking she was Japanese. Her school textbooks said little about the Ainu, the aboriginal people of Hokkaido, or Japan's other minoritiesKoreans, Chinese and Okinawans. She learned Japan was racially pure; it was something political leaders boasted about. In the mid-'80s, Prime Minister Yasuhiro Nakasone even declared there was no discrimination against minorities in Japan since there were no minorities. So when Hasegawa's father told her at the age of 18 that she was Ainu, it turned her world upside down. "I had grown up thinking there was only one race in Japan," says Hasegawa, now 23, who works in Tokyo at Japan's only Ainu restaurant. "I hadn't even heard of the Ainu." Hasegawa's parents had feared their daughter would face bullying and discrimination as an Ainu. Physically indistinguishable from Japanese, many Ainuincluding Hasegawa's eight brothersstill prefer to hide their ethnic identity. But Hasegawa herself is one of a small but growing number of Ainu who are learning about their ethnicity with new pride. Younger Ainu are enrolling in language classes to learn traditional songs and folk tales. Ainu communities are reviving old ceremonies to honor sacred animals like salmon and bear. While all Ainu use Japanese names, some have started adopting traditional Ainu first names. Ainu activists have also begun to make their voices heard. One group is suing the Hokkaido prefectural government in a Sapporo court, accusing it of mismanaging Ainu land for the past century. Hasegawa is part of another group fighting for recognition of the Ainu's rights as an indigenous people through the United Nations Human Rights Commission in Geneva. The Ainu have started to forge bonds with indigenous groups in the United States and other countries. The steps are small and largely symbolic, but they have contributed to a resurgence in ethnic pride that was unimaginable even a decade ago. "To be Ainu used to be a shameful thing," says Tatsue Sato, chairman of the Ainu rights group Rera no Kai, or Wind Society. "Now there are young people coming forward who are saying 'I'm proud to be Ainu.'" That has happened none too soon for the Ainu, whose culture has been in decline for more than a century. Traditionally hunters and fishermen, they lived in small communities along the rivers and seashore of much of northern Japan and the Russian far east. But as Japan industrialized in the 19th century, the Ainu were herded onto plots of substandard farmland and forced to adopt Japanese ways. Tokyo barred the Ainu from hunting and fishing and banned Ainu ceremonieseven use of the Ainu language. Smallpox and other diseases brought by Japanese settlers pouring into Hokkaido decimated the population. Today there are as many as 110,000 Ainu, by their own estimates; Japanese officials put the number at 25,000 but count only people who declare themselves as Ainu. As a minority in their own land, the Ainu faced discrimination and prejudice. Japanese called them "dogs" (inu means 'dog') and treated them as second-class citizens. Japanese settlers commonly took Ainu women as sexual slaves, according to Dennis Johnson, author of a recent history of the ethnic group. "The fate of the Ainu women was nothing short of tragic," Johnson writes. 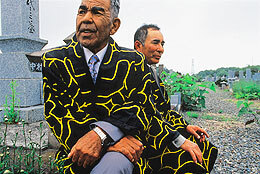 Forced off their land, Ainu men had to work for Japanese fishing and logging companies. Few Ainu rose to positions of prominence. Kenichi Kawamura, director of Hokkaido's Ainu Memorial Museum says his father managed to become a railway surveyor but was once almost deliberately buried alive by his crew, who resented having to work under an Ainu. Says Kawamura: "We were treated as uncivilized barbarians." In the postwar years, the ban on speaking Ainu was lifted, but government pressure to assimilate continued. Ainu faced discrimination in marriage and employment, and children endured bullying at school. Ainu remained oddly absent from the Japanese popular imagination as well, even though the two groups had fought on and off for hundreds of years on the main Japanese island of Honshu. When the Ainu registered at all, it was often through a distorted lens of prejudice and stereotype. Japanese tourists who visit Kawamura's museum are surprised to discover he wears shoes and speaks Japanese. Ironically, it was Nakasone's remarks about Japan's racial purity that helped to galvanize the Ainu. They protested the comments and started to look for ways to make their voices heard. In 1992, an Ainu addressed the U.N. General Assembly for the first time. Shigeru Kayano, an Ainu who had spent years collecting cultural artifacts and recording Ainu oral culture, won a seat in the Upper House of the Diet in 1994. In his inaugural address he spoke Ainu, a first for Japan's parliament. Kayano led a court battle against a dam built on Ainu land, and in a landmark 1998 ruling, a judge in Hokkaido recognized the Ainu as an indigenous people for the first time. While Tokyo has yet to follow suit, it no longer claims Japan has no racial minorities. Recognizing the Ainu as an indigenous people would raise land-rights issues the government would rather avoid. But after intense lobbying by Kayano and others, Tokyo officially accorded the Ainu minority status in a law passed in 1997. Replacing the century-old and widely hated Former Aborigines Act, the main vehicle of Japan's assimilationist policies, the legislation was a huge step forward. But it was silent on the issue of land rights, to the chagrin of many Ainu. And while the law did mandate the return of money that the Hokkaido prefectural government managed on behalf of the Ainu under the old law, many felt the $14,000 the government agreed to pay was far too littleand doesn't compensate the Ainu for the land they say was stolen from them. The government should pay out 2,500 times that amount to reflect inflation, or return the land, says the Ainu museum's Kawamura, who is leading a group of two dozen Ainu plaintiffs. Kawamura's group also wants the government to explain what exactly happened to Ainu land expropriated by the government. The authorities insist that they have already returned all the land but admit that relevant documents have gone missing. Ainu activists are also demanding the return of remains dug up from village graves by Japanese university departments for research, mostly during the 1930s. Hokkaido University's medical department, the biggest collector, accumulated more than 1,000 skeletons. Each skull is tagged with the name of the village where the person was buried. But the names of the individuals weren't recorded, so families can't identify the remains. A mausoleum on the university grounds in Sapporo still holds the bones of 972 Ainu. For the past several years, a small group of Ainu have performed a traditional memorial rite annually in front of the mausoleum and other sites, dancing and praying and offering sake to calm the spirits of the dead. But some Ainu believe the spirits will never find peace until they are reinterred at their home villages, and they want the university to pay for it. The university says it has done enough by building the mausoleum. None of this will bring back the disappearing Ainu language, one of the most pressing concerns for Ainu activists. Fewer than a dozen people speak it, all of them elderly. When they pass away, it is unlikely Ainu will survive as a living language. The classes that have sprung up in the past decade are important but probably too lateas Hasegawa points out, there is nobody to make up new words for such things as "mobile phone" and "Internet." But the use of Ainu in songs, skits and stories, even in everyday conversation, is growing, and that guarantees a future for the language, argues John Maher, an expert on the Ainu language at Tokyo's International Christian University. "Paradoxically, that has occurred while the number of native speakers has been dwindling." Are the attempts to revive Ainu culture and language too little, too late? Not if people like Hasegawa have their way. After discovering she wasn't an ethnic Japanese, Hasegawa embraced her new identity, meeting other Ainu and learning traditional dance, songs and even cuisine. The restaurant where she works serves traditional Ainu dishes of venison and salmon. The important thing, she says, is to build on what has been achieved in recent years: "We need to create a society where Ainu can live comfortably. We have to increase our pride and transmit that to Japanese and to other Ainu." That way, maybe future generations won't have to find out who they are the hard way.